To commemorate the 80th anniversary of the peal rung by the father of 5 who rang the same bell to the same method on 22nd January 1938. First as conductor in this method for 6. 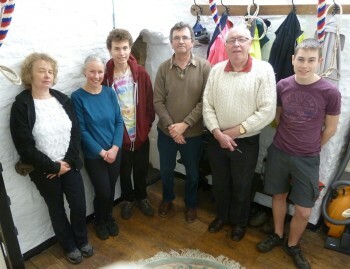 Left to right in ringing order in Stone's newly decorated ringing chamber. Guest appearance by the vacuum cleaner. Last updated Tuesday, 23 January 2018 at 09:15:41. First submitted Monday, 22 January 2018 at 18:14:20 by Alistair White-Horne. Sent for publication in The Ringing World on Monday, 12 February 2018 at 10:14:56, and printed in one of issues 5575, 5576 or 5577. This performance has been viewed 525 times.